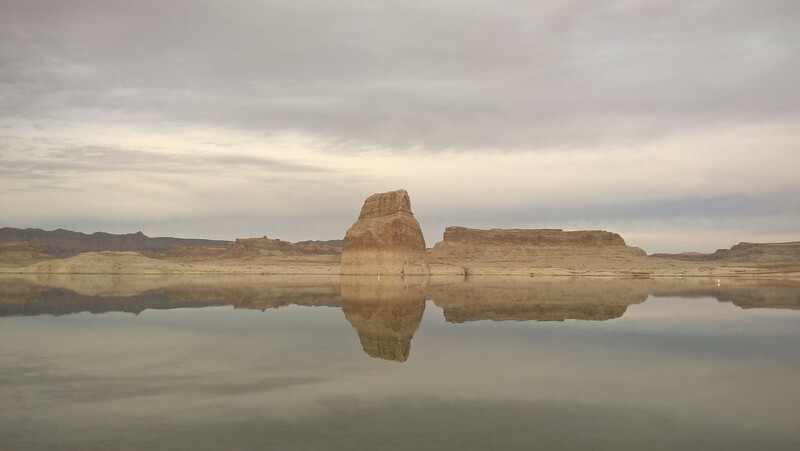 Can’t remember when this was taken, but I love looking at these rocks/cliffs across the lake. Well, it did. And it was A big move, but not the last one ever. But it got me closer to where I am today, so yes, it did change my life. Just not in all the ways I thought it would. People ask me why I moved cross country to an area where I pretty much knew no one. People asking sometimes sound like they don’t understand how I could do that, or that they think I’m brave for doing it, or that they think I’m crazy, “Oh, I could NEVER do that…” And I realize when I start telling my story (I’ve tried to abbreviate for folks as much as possible but inevitably, when the words “Harvard Law” come out of my mouth, there’s a bunch more questions that follow), just how crazy it sounds. Leave a job at a premier law school where I was making more money than I had ever made, using both advanced degrees I am still paying for (and likely always will be until I hit retirement age or die), to take care of animals who poop all day (an average of 360 times, to be exact), and then start working at a campground as a supervisor. I now have much more responsibility than I think I ever have in a job before (except for maybe when I was a lawyer and that came with its own sort of craziness.) It does sound a bit insane, doesn’t it? Photo taken at the “bewitching” hour, i.e. right before sunrise. So I find myself again not completely sure of what I am doing at work, but as I mentioned to one of my team leads yesterday, I have learned to embrace change more than i ever had before the past year. I used to be afraid to take chances. To make big choices and then deal with the consequences. I was most DEFINITELY afraid of failure. This is not to say that any of that doesn’t scare me now. It still does. I’d be lying if I said it didn’t. It’s just that I can put things in a different sort of perspective. I told my Team Lead that whereas before, something might have super stressed me out, I now try to think to myself as to whether something will still really matter a year from now. Or, I think of the changes I’ve made in my life in the past year and try to compare the change or choice I am about to make, and see how they match up. And, not for nothing, but I’m 43, and I keep hearing about health problems that some of my former high school classmates are going through or have gone through, how many have already died. So, it kind of puts things in perspective. My most recent pre-sunrise photo. Made getting up so early so worth it. Someone will show me how to do something and at the time it’s explained to me, it makes sense and I can do it. But trying to retain it all is a bit daunting. At times, I feel like a brand new reference librarian all over again – like the proverbial deer caught in the headlights, I might freeze when you asked me the simplest question. Or, how I used to freeze when anyone asking a question would involve business terminology like stocks, equities, securities. You could ask me to find a law or treaty for you in a language I couldn’t read, no problem. But ask me a business-related question and I would sheepishly call for help from my old officemate who was super patient with me all the time. (God, thinking about her now, I really miss her a lot.) Sorry, tangent there for a minute…. I took this a few hours before a storm rolled in. Just loved seeing the weirdness of the colors of the sky. I thought it almost looked the color that a sky would look before a tornado hits. Also loved how dark blue the lake appeared. I’ve always been enamored with storms. I’ve been trying to calm myself down when moments of panic or self-doubt occur, by remembering I used to be a reference librarian, and if I do so say so, a damn good one too. I was persistent in finding things, even when I had very little to go on sometimes. I felt confident in my skills. And now, well, it’s just hard being the one asking all the questions again, not having the answers, and knowing that at the same time, I will have people looking to me for answers. I’m going to have people reporting to me who are trying to figure me out, what kind of boss/supervisor I am going to be. Maybe that is the part that stresses me out the most, knowing I will have people looking to me to be a leader, while I’m still trying to figure out just what the hell I am doing, and how to navigate the large organization I’ve just joined. Maybe. Or maybe it’s just not feeling like I have my feet firmly planted underneath me just yet. I’ve always been a straight shooter and one thing I’ve never been is the person who plays politics. I don’t kiss up to people, that is just NOT in my nature. But I know that others do, and I know that others will try to stab you in the back. Some friends in the past have faulted me for being too trusting. Maybe I am, but I would hate to be cynical and negative all the time as the alternative. The girl training me at my job is the outgoing supervisor and a person with whom I wish I had spent more time working. She’s very cool and seems to really have the respect of the people underneath her. She works very hard also. She told me I am doing well and that she thinks I might be placing too much stress on myself right now. But that’s the Type A personality in me that got me through law school. The part of me that always feels like I need to work harder than anyone else, just to stay up there with them. It’s the part of me that always felt, when training for a marathon, like I had to run just one more mile more than anyone else. I really did. Ask my training partner from back then. Some days we would have 14 miles on the training plan and I would tell myself to go home and run just one more. I know things will eventually calm down. If you’ve read all the way through this, then you’re either on a mission from God, or a glutton for punishment. Either way, I thank you. I do hope you have enjoyed some of the photos sprinkled throughout this post. I’ve been running a lot more lately, with the gorgeous sunrises that I am treated to almost every morning. And now, I’m going to take a deep breath and hit “publish.” Some posts are just cathartic for me to write, whether or not they ever get read by anyone. Have you ever felt alone, while you’re in a crowd? I have, and I’m sure I’m not alone (no pun intended), in this. Last weekend, I just felt the need to get out of town. I knew on Sunday the weather would be fine, but on Monday (my second weekend day), the weather would turn to crap with a mix of snow and rain. So, if I was going to get out of Dodge, I had to do it that day. I have really missed being around a decent-sized body of water. Back east, I had a reservoir out back behind my apartment building, and even while I was there, I knew how much it could ground me, being able to walk near it or see it every day. There were days I was very stressed out when I came home from work, and a short walk outside with little Osito, watching the waves while she did her business and sniffed every leaf she could find on the ground, and I would feel a lot better. Lone Rock in the distance. My friend Jason tells me that the water is a few hundred feet deep out there. 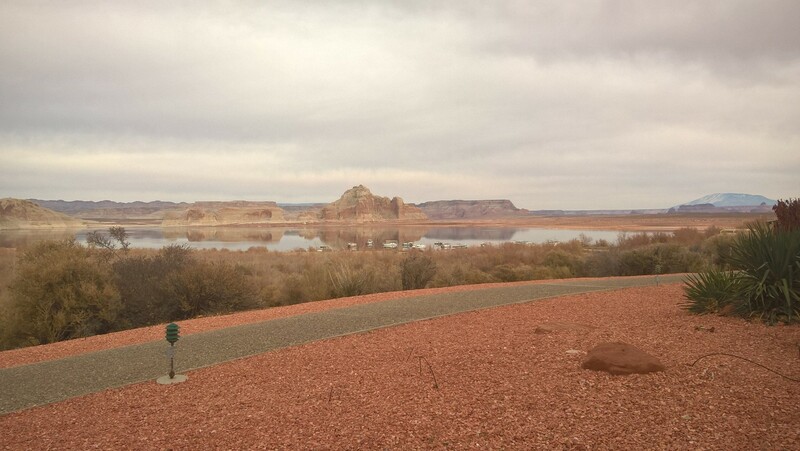 So, I decided to go to Page, AZ – specifically, Lake Powell. I’ve posted pics of Lone Rock Beach before, but every time you go, it looks a bit different. The changing light makes the lake look new each time I go, and as the minutes tick by during the day, it changes as well. It’s one of those places I can breathe. And the other day, it was just so amazingly quiet. It’s colder here now, so there were no boats out on the water (other than in the marina). I had said to my friend Dan that day, I needed to hear some waves. There were no waves that day, as you can tell from the photos. The water was completely still. While I was at Lone Rock, there were only a few other vehicles there. It was weird to be there and not see any RVs parked along the shore. (You can dry camp overnight there, I guess, however, only during certain times of the year. You need to pay for a camping permit with the NPS, if you are going to be there between the hours of 8 pm and 6 am.) It’s weird, the things that you associate at times like that. I saw a couple with their dogs playing on the beach, running around and sniffing everywhere. It brought me back in my mind to a weekend trip I had taken once to Cape Cod when I was married. I remember watching my (then) husband play on the beach with our yellow lab, Ruthie, and remembered taking a photo of him while he was taking a photo of the sunset. It’s at times like these that I have missed having someone in my life. Someone to share quiet moments with. Don’t get me wrong – I’m ok with being single, and having the freedom that comes with that. But sometimes it would be nice to have someone again. I sat near the marina that day for a while and just marveled at all the boats still in the water, in January. Back east, that would not have been the case, as many times even parts of the Boston Harbor would freeze up. I just listened to what I thought were generators humming – not sure. It was so quiet there, that the sound of just two people walking on the dock could be heard quite far away. I saw a boat named “My Viagra” and it really cracked me up. I remember thinking “Compensate much, dude?” 🙂 Being near the marina reminded me of many trips I’ve taken with my mom on vacations over the years. Anytime we were near a place with a marina, we liked to go and sit and watch the boats come in and out. We used to look at the bigger boats/yachts and think of what those people did for work to be able to afford them. (I know, if you have to ask, you can’t afford it, lol.) There was something with this visit that I noticed, though, that I had not seen at a lot of other marinas back east. So many of the boats had water slides coming off of the back end. I guess that’s just one difference between the northeast and the southwest. The water is usually so cold in the northeast (especially if we are talking the Atlantic Ocean) that you don’t really spend a ton of time in the water. It’s refreshing to go into it once, but you get in and get out. At least I did! Before I hit the marina, though, I tried (again, unsuccessfully) to take a tour of the Glen Canyon Dam. I had looked online and seen that tours were given at 9, 11, 1 and 3. But when I got there, at 12:40 pm, the guy said the 12:30 tour had just gone down. I told him that’s not the time I had seen online. Clearly, there’s an outdated web page up there. Next time, I will call to make sure what I’m seeing is up to date. I didn’t feel like waiting around until 2:30 to take the next tour so I walked around the dam’s visitor center for a bit and saw pictures of Horseshoe Bend on a big digital display they have inside. I know that walk to it can be pretty hot in the summer, so I decided to go look at it that day instead. I’m so glad I went. It’s amazing how many people from different countries I saw there that day. And I realized I have missed being around people from many different cultures and walks of life. At my last job, I was exposed to students from all around the world, every day. I saw couples taking pictures of themselves, standing close to the edge of the cliffs (you could tell who was afraid of heights by the tentative steps they would take toward the edge, and I admit, I was one of those folks.) I saw groups taking “action” shots and people posing as if they were “climbing” up the edges, yelling to one another “use your trying hard face!” It was funny, and I found myself laughing at some of the jokes. And I wished I had someone with me. 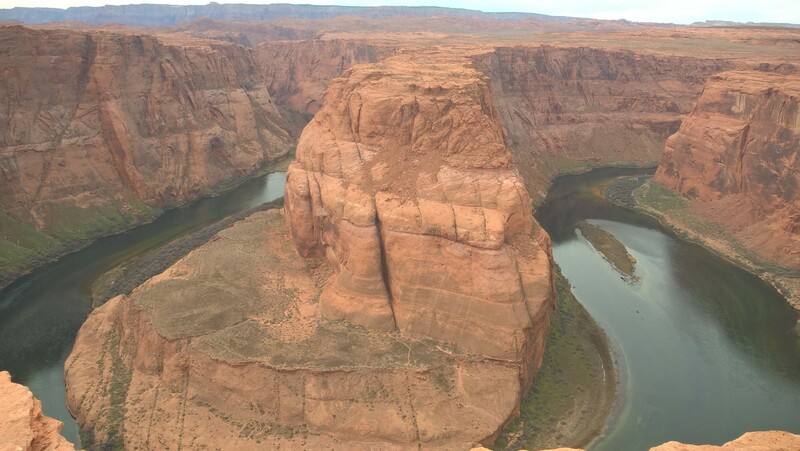 Even if it was just a friend, someone to say “oh hey, look at that little building down there near the rock in Horseshoe Bend – what do you think it is?” Just someone to share the experience with, you know? 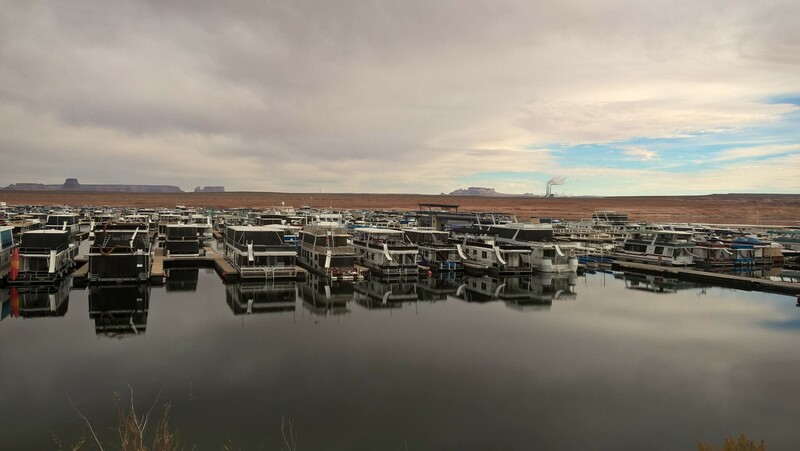 Anyway, the picture below is from out back behind the Lake Powell Resort. As I stood near the one bench and looked at all the empty patios at the waterfront views, I marveled at the difference between now, which is their low season and what the place will be like in just a few months when the crowds return. I can’t wait to return there at that time. 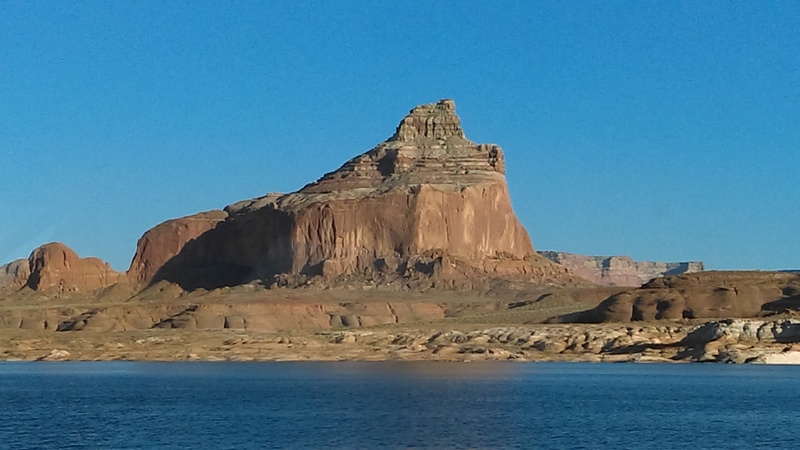 view from sitting out back near the Lake Powell Resort – if you can go there, I highly suggest it. Imagine having this view outside of your hotel room! Anyway, I just wanted to share some images of the beauty that is within a very short drive from me – just 75 miles away. If you’ve never been to Lake Powell, I suggest going. And the resort of the same name is the only one with property that has rooms on the lake, just an fyi. Have you ever felt the same way, alone but not alone? Luckily for me, it was fleeting and I comforted myself with knowing I was surrounded by beauty. Just one example of the beautiful places I get to visit on my day off. 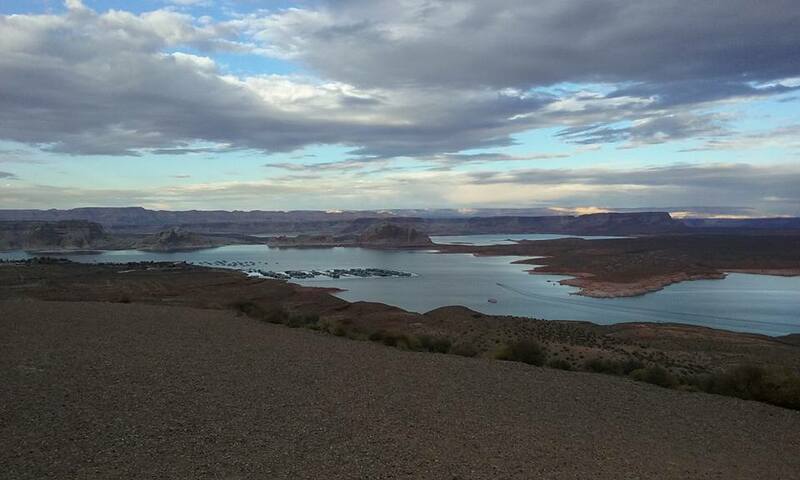 This is Lake Powell which is in both Utah and Arizona. Hi folks, just wanted to let everyone know I’ve not forgotten about the blog this week, but I’ve been really trying to get my writing going, book-wise. So I’ve been getting up early, like usual, about 4-4:30 a.m., and instead of going to the gym every day, have sat at my chromebook and let whatever thoughts I had in my head come out onto paper. It’s very hard to not edit myself all the time, but that’s a skill I am working on shutting down. The good news is that I have two different projects going. The first is a non-fiction one, self-help, kind of work. Also, a fiction book. Not sure which one will win out and be my first finished project, but we shall see. I’m finding that the more I write, the more I want to write. However, I still find it more difficult to fill up a blank sheet of paper, or white screen, than with my blog editor. With my blog, I find the words sometimes flow much more freely. 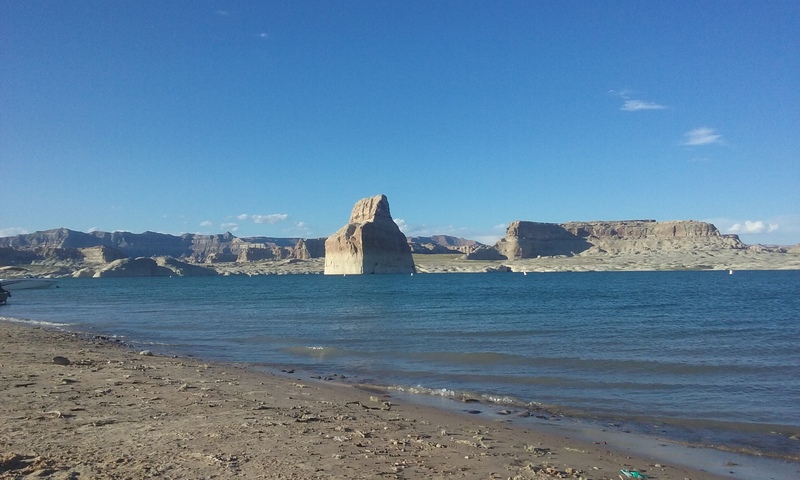 Lone Rock Beach at Lake Powell – this place is one I will return to again, and again, and again. First off, I would like to thank everyone for reading my blog. This week has seen the most views of it since I started it two years ago. Not sure why, but I’m so glad people are reading and seem to be enjoying it. Thank you so much. On the 11th, it’ll be one month since I pulled into my RV spot. One month since I could stop the cycle of loading all my furballs into the car every morning, praying the hotel clerk wouldn’t see that I had five carriers loaded into my small car! One month since I didn’t have to get up and just drive, drive, drive, every single day. Ok, sorry, I just had to yell that. I’m back now. And calm. 🙂 And I do remember what happened 14 years ago on this date. How could any of us forget? Lone Rock Beach at sunset. Every minute, the view changes – it’s wonderful and enchanting. That was my welcome to rv living, or RV Living 101 class, you could say. By the way, to those of you who are RVers, I watch youtube videos, etc., but are there good websites to learn about RV maintenance in general? As in checklists of what to check for and do before winter hits, etc.? 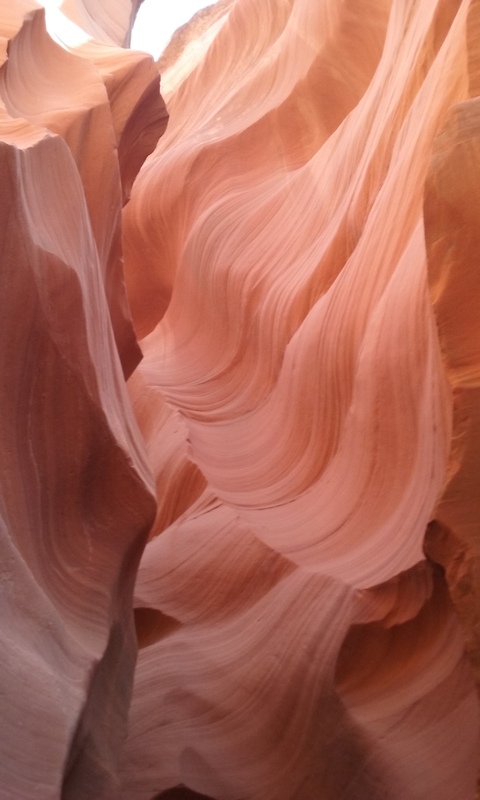 Taken from inside Lower Antelope Canyon, outside of Page, AZ (close to Lake Powell). I’ve also gone to numerous national parks – the $80 it costs to get an annual pass pays for itself. Each visit to a national park on its own would cost at least $25-30. I’ve been to Bryce National Park (twice), Grand Canyon North Rim (second time in 13 years), Zion National Park, Arches National Park (last night of my cross country trip), and Lake Powell (twice). It’s hard to pick a favorite among them, honestly. They are all so different and beautiful in their own right. 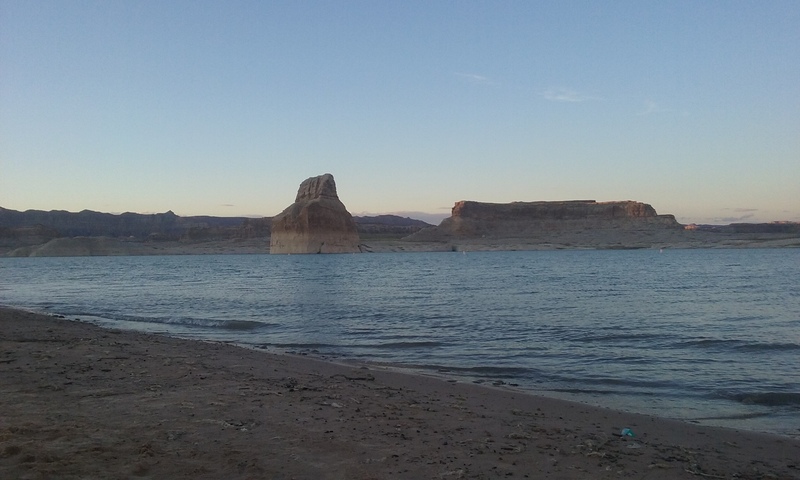 Lake Powell was the most recent, and it was the only time I have heard honest-to-goodness waves crashing against the shore in over a month, so I think that might be edging itself out there in front for that reason. 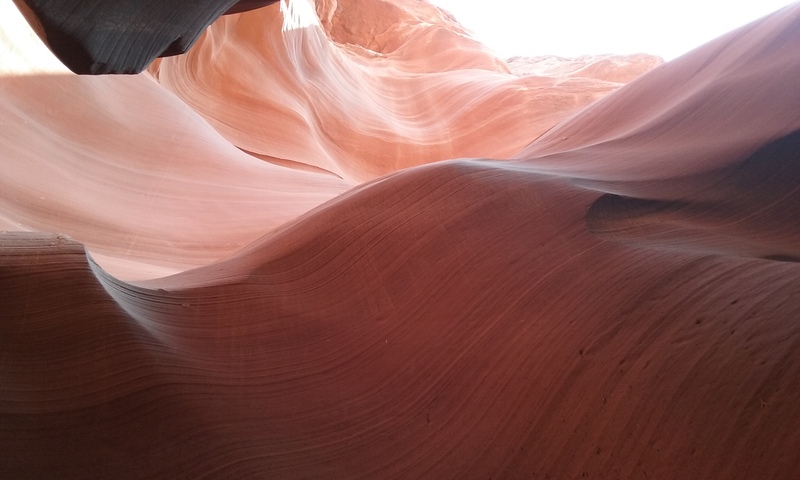 Another shot of Lower Antelope Canyon. The light changes constantly, and is amazing. It’s on Navajo Tribal Land, so all tours are guided. I’m in the middle of my fourth week at the new job. I feel like I’m establishing a new routine, both at work and in my personal life. I’ve carved out time in my day (very early in the a.m.) to get to the gym, and have started taking my chromebook to the sanctuary so I can work on things over my lunch break (including blog posts!) My “weekend” days are not on the actual weekend which is good and bad. When you’re trying to meet people, it can be hard when your only days off are the ones when they are at the office or their job. But if there is one thing I’ve learned over the past two years, it’s to not be complacent. So I put myself out there, and try to meet others. And in my days off, I’m making sure I see more of this beautiful land called southern Utah. The beauty of this area is a huge part of why I moved out here. I wanted to see beauty and get out there and have an outdoor lifestyle. I’m sure that come winter, it may be more difficult to do so, but until then, baby…..I’m getting out there as often as I can! I’ve pushed myself to walk in places at the parks where before I would have been scared to walk due to my fear of heights. With every “push” I give myself, I feel myself getting stronger. It’s a wonderful feeling to know you can be at any age and still be growing. 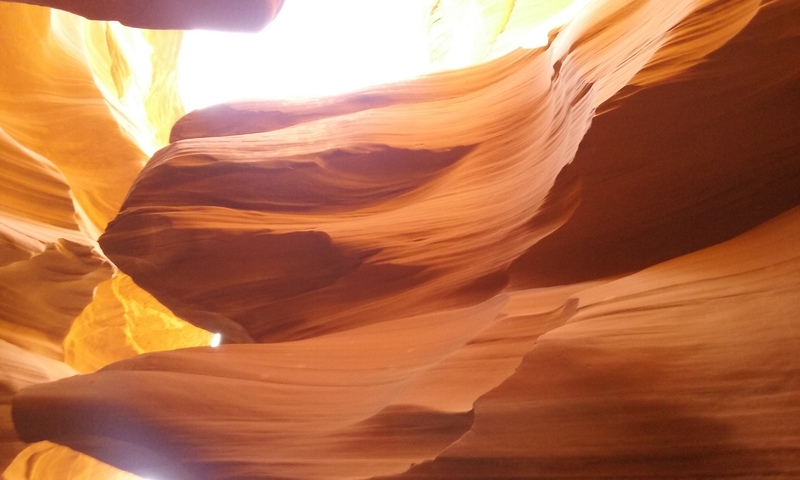 My phone doesn’t do the best with the lighting in the canyon, but I just love how the sandstone looks, and curves.